Parius are one of the most exciting metal acts of recent times. Their music combines blistering tech-death with some entertaining narrative, and the odd lashing of humor. Their latest full-length album The Eldritch Realm is a quick-witted burst of awesome ideas, and an essential listen for anyone seeking fresh original metal. In celebration of this great record, Everything Is Noise recently had the honor of catching up with Parius‘ vocalist, Louis Thierry to discuss all things Parius, starting with the spectacular storyline to Tales From The Eldritch Realm.‘The Eldritch Realm started with me wanting to make a Twilight Zone-style story’ explains Louis. ‘Since each episode of that show is usually tied to a theme, I wanted mine to be the idea of being caught in a circle and stuck on the day-to-day grind; finding it hard to break out’. ‘The story follows a man with eternal life as he journeys to retrieve his mortal soul guided by the Black Moon, Lilith. He begins by contemplating the nature of his situation and sets off to see what lies beyond this realm and into the next, dealing with the answers he finds while being hindered by a cosmic force’. The theatrical nature of this story shines clearly through in the album’s music, with some parts that are outright funny. Though Parius take their craft seriously, it’s also important that the band let also loose with their imagination. ‘When I was writing my parts for The Eldritch Realm I definitely wanted to inject a sense of theatrics into the music. Sometimes that ends up being light-hearted and silly. I think having parts like that help to break up the metal assault so that the experience is more dynamic’. Regarding that experience, Parius‘ clear mission is to make their music as original as possible. While the musical taste varies from member to member, bands such as Dream Theater, Between the Buried and Me, Mastodon, Opeth, Gojira, and, of course, Metallica are the staple diet across the entire line-up. ‘While we try to avoid lots of modern metal cliches, we are obviously a pretty heavy band and utilize drop tuned guitars, double kicks, and screams. We love tons of heavy stuff, but we’re all into to different kinds of music, and we like to try to bring those influences into the mixture. We try to avoid core elements because we want to work on having our own sound. I try to vary my vocals to keep things fresh. We like it when the bass is audible in the mix. We like to dabble in other genres to see if we can do our own take on it. For instance, “Between Hell and I” started with us wanting to write a black metal song. ‘I think we’ve grown from the days where we just wanted to sound like the bands we were into at the time. Now we strive to have songs that are heavy and sometimes pretty technical, but have lots of personality and musicality’. And grown, they have. It’s fair to say that the band have refined their sound since their 2015 debut release, Saturnine. And this seemingly organic evolutionary process has, in general terms, had Louis and guitarist Ryan Rauch at the creative helm. But other band members have chipped in too, including some extra vocal contributions from their producer. ‘Ryan and I have been responsible for the majority of our stuff so far. We’re always discussing songwriting and what not, but our guitarist George Fenton actually earned his first writing credits on this most recent release; and bassist Kenny Rentz is responsible for most of the bass and a decent chunk of “Crashing Black Moon”. ‘Our current drummer, Dan Silver just joined the band as we were wrapping up this last release, but he has been a perfect fit for us, so we’re looking forward to be able to collaborate with him as well. ‘We also owe a lot of credit to producer, Chris Kelly, who has produced every official release that we’ve done. He’s great at adding some extra layers and making us sound better than we should’. So the marvelous product of a Parius album is a collaborative effort, as one would expect from such rich and layered music. And over the seven years since their genesis, the band have also learned to be more efficient with their writing process. ‘A lot of times when we’re writing, we’ll actually keep it a little bit simpler, and then go back later and try to make it more interesting with some finer details. We do try to be terse with that stuff though. A lot of this doesn’t apply to our earlier work, but we’re definitely focused now on trying to come up with something musically satisfying rather than just trying to play something that sounds dexterous. We’re pretty hard on our music and spend time with in-progress songs to make sure it’ll actually be something we’re proud to release’. Everyone who has heard The Eldritch Realm can testify to the level of work gone into it. Those same people know what comes next… Live shows! And performing such technically proficient songs in front of a live audience can’t be an easy job, right? ‘Bringing these songs to a live setting has been a pretty big challenge’ confesses Louis. ‘There’s more layers and harder parts than ever; but Dan has helped our live sound exponentially since joining, and we’ve been enjoying playing these new songs a lot’. ‘It is a really cool thing, but to be honest, it doesn’t compare to writing and recording music, for me, at least. When I try to recall my favorite memories with the band, they’re mostly from writing or recording’. But the question on every fan’s lips: What next for Parius? Another tale from the Eldritch Realm perhaps? Or maybe something different altogether? Only time will tell. But hopefully not too much time. 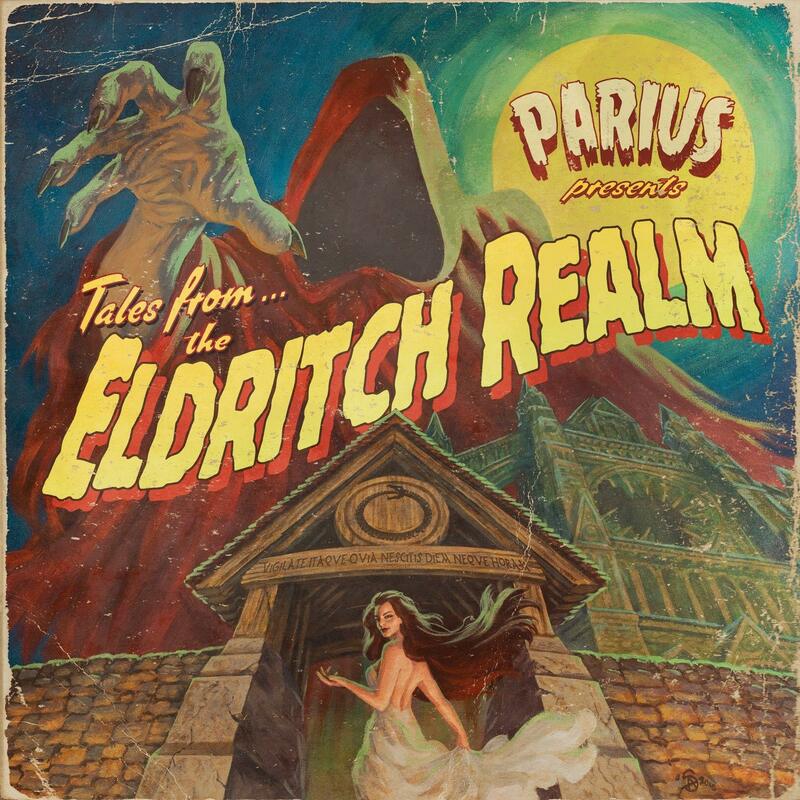 The Eldritch Realm is available to hear, along with earlier records on Parius‘ Spotify and Bandcamp page. For news, merch and other info, check out their official Facebook page. Previous PostIrreversible Mechanism - "Immersion"
Next PostKurushimi - "What is Chaos?"